Whether youre creating sales pages, affiliate landing pages, even content pages ... theres many ways youre losing potential profits from every visitor you receive. From my years of selling and promoting online, Ive now got an automatic checklist that helps boost the sales of any site I put together. And what Ive done is broken down many of these automatic checks into a series of coaching videos you can follow and easily apply to your own sites to great benefit. These are fundamental tactics and strategies for creating and writing your websites to help put as many things in your favor as possible, so that as many visitors as possible turn into customers, clicks, affiliate commissions ... however it is youre looking to profit. In this video Ill reveal a very easy to apply yet underused tactic that can get a lot more of your visitors hooked into reading your text instead of leaving your site. Here Ill show you a dead simple yet vital tactic to make sure youre maximizing your website audience. In this video Ill show you a great tip for making your web pages load faster for all your visitors. Here Ill talk you through an incredibly simple yet often overlooked way to help maximize the number of sales your website makes. In this video Ill talk you through a fundamental and powerful way to make your visitors feel great about ordering with you right now. Here Ill talk you through case-studies of sites making great use of graphics to increase their sales, and how you can use these tactics as well. In this video Ill talk you through a stupid-simple tactic that instantly makes everything you write a lot more inviting for your visitor to read. Here Ill talk you through an open secret that if youre not using right now, you literally are losing money with every website visitor you receive. In this video Ill reveal a very quick and easy way to add instant credibility to your message. Very important for any type of promotions online. Here Ill talk you through how one silly web design mistake lost me a number of potential customers, and how you can easily avoid this pitfall. In this video Ill talk you through one of the most basic, most fundamental, but most important and underused tactics for getting and keeping the attention and interest of your visitors as soon as they hit your page. Here Ill talk you through the dangers of a common web design tactic that can lose you a surprising amount of sales. Ive even seen this rookie mistake on the websites of established businesses. By knowing this youll avoid their expensive mistake. In this video Ill talk you through ways you can profit from your visitors weeks, even months after they come to your site. This alone can be one of the single-handed most profitable changes you implement to your site. Here Ill reveal a dead easy way you can create and design a web page thats professional, very usable, and very readable - in five minutes or less! Even sites that make six figures a year are using this tactic, so why arent you? In this video Ill talk you through one of the most overlooked and least talked about tactics, that can practically make the difference between your site being a runaway success, or not. 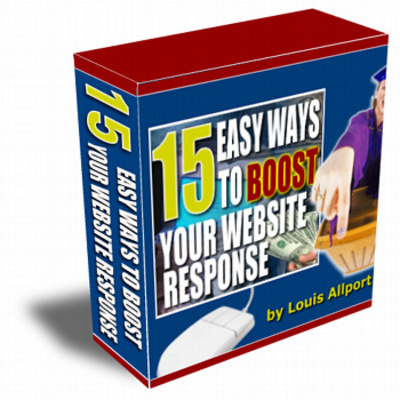 15 Ways To Boost Website Response boost trafic to your web 131944854 4.99 gracenicholas Fresh Download Available!